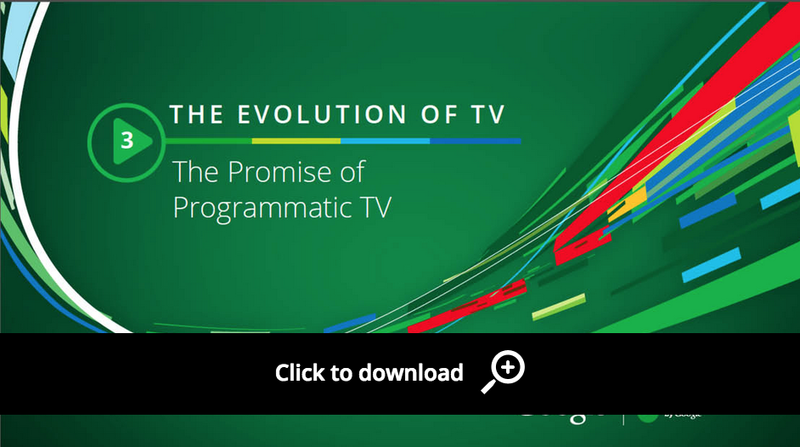 In Part 3 in our Evolution of TV series we dispel the hype about programmatic TV, address the challenges, and concentrate on its promise for brand advertisers, programmers, and broadcasters. Download the PDF from Think with Google for the in-depth story. "TV and chronological social channels can feel fleeting. If your audience isn't watching that show or checking their feed that day, it's gone. We chose YouTube as a hub in part because our content lives there for as long as we want. Our YouTube channel is a collection, a library, a content repository. People on YouTube care less about when a video is posted and more about whether or not it's relevant to them in the moment." "There's a fallacy out there that real-time marketing happens at the last minute. A lot of our content was at least partially created before the VMAs ever began. Our creative team prepared content for different outcomes or situations that could occur during the event. They designed and wrote content that can be manipulated easily in the moment. That way, almost everything could be approved ahead of time, and all the team had to do to make it relevant was swap in a word here or a photo there." "For us, content isn't 'we post; you respond.' We stick around to have an authentic, ongoing, two-way dialogue with our fans.…To prepare for that audience interaction, we carefully train every community manager (CM) who works with us. We figure out as a team what the message should be in the various situations they'll encounter, and then we train our CMs to adjust that generic messaging so that we sound personal, never forced or canned." Read more of our Q&A on Think with Google to find out the lessons CLEAN & CLEAR® learned—that any brand can put into practice. In the last year, Americans have doubled their digital video viewing, and brands are responding accordingly—focusing more on video marketing than ever before. In fact, many are building comprehensive strategies around YouTube campaigns. And when brands go big on video, the rewards can be even bigger. For instance, Johnson & Johnson Consumer Companies brand CLEAN & CLEAR® earned millions of YouTube views for its anchor series, SEE THE REAL ME®. More importantly, it boosted market share by double digits. solution allows you to gather brand metrics about YouTube ads in a matter of days. Advertisers across a variety of verticals have used the tool to test and optimize their online video content. To understand how our Google Preferred offering performed for advertisers, we conducted several different meta-analyses using Brand Lift data. After analyzing around 50 campaigns from Fortune 100 brands and category leaders running on Google Preferred (some of YouTube’s most popular channels), we found that 94% of the campaigns drove a significant lift—an average of 80%—in ad recall. We also found that 65% of Google Preferred ads saw an increase in brand awareness, with an average lift of 17%. This is particularly impressive considering that the brands in the study were already well-known. We also measured YouTube’s impact on what we call “brand interest,” or interest in a brand as measured by an increase in organic searches for it on Google. Looking at more than 800 Brand Lift studies, we found that 65% of YouTube TrueView campaigns drove a significant lift in brand interest, with an average lift of 13%. These numbers tell a compelling story. YouTube advertising is about more than lean-back impressions; after YouTube viewers see ads they love, they lean in and search for those brands and products. Content may be king, but brand metrics play an integral role in everything from planning quarterly media spend to creative direction. With tools like Brand Lift, brands can now have access to brand metrics that matter in near real-time. See how brands are using Brand Lift to move the needle, and get tips on how to drive impact with Brand Lift on YouTube in our YouTube Insights report for March. For online video platforms like YouTube, engagement metrics (such as views, likes, shares, comments, and watch time) provide a basic barometer to how an audience responds to videos. While these metrics are important to inform strategies and creative direction, when it comes to measuring effectiveness views and shares are often a proxy for brand metrics such as awareness, perception, and audience interest. In the past, gaining insight into brand metrics has been tricky. While you could get instant feedback in the form of clicks and views, it was difficult to measure brand impact without expensive, time-consuming testing, and sometimes those results wouldn’t come in until the campaign was over. When it comes to YouTube ads, that’s no longer the case: our Brand Lift solution allows you to gather brand metrics about YouTube ads in a matter of days. Advertisers across a variety of verticals have used the tool to test and optimize their online video content. So brands know how fans are watching, but they also need to know who’s watching. You may not be surprised to learn that a large audience of young millennials watches SXSW content—but an older audience is beginning to follow the festival as well. In the last year, the 35–55-year-old age group has more than doubled its watchtime of SXSW videos. Head to Think with Google for more stats about SXSW trends on YouTube, and find out how to reach these devoted music fans throughout the year. Hundreds of buzz bands and under-the-radar artists are in Austin this weekend for the South by Southwest (SXSW) festival—along with tens of thousands of music fans. But you don’t need to attend the festival to engage with SXSW. New data reveals that millions of passionate, interested music lovers are watching the festival on YouTube and on mobile devices. 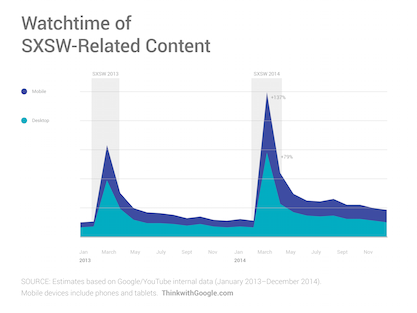 Driven by mobile, U.S. viewership of SXSW content on YouTube grew by 62% in 2014. This presents a perfect opportunity for brands to reach SXSW fans beyond Austin’s city limits. As soon as people hear the festival buzz—the most surprising performances, the hottest new artists—they’re looking for content on YouTube, pulling out their smartphones more than ever before. Compared with viewership immediately after SXSW 2013, watchtime of video content from last year’s festival increased by 137% on mobile. During March and April 2014, 40% of searches related to brackets were on mobile. As mobile searches continue to rise, marketers should increase their focus on second-screen habits, optimizing campaigns for smartphones. Include casual fans in your marketing. Top search questions about college basketball come from entry level fans: “How long do college basketball games last? and “how many quarters in college basketball?” dominated during the tournament last year. With more fans to reach than ever before, marketers shouldn’t just focus on fanatics—make sure to consider newbies in your strategy. Capitalize on the moments that matter. In 2014, the peak day for highlight searches was the day between the Final Four and the National Championship—a day when no games were scheduled. Take advantage of moments like these that only happen online. Add to the action; don’t be a distraction. A Google Consumer Survey revealed that while second-screening during games, fans are most likely to (in order): check other scores, watch highlights, search for information about players, and post on social. Join the conversation in a way that complements what they’re doing rather than take them out of it. Read more March Madness tips and stats on Think with Google, and enjoy the wild month of basketball to come! Is your bracket ready? Better yet: is your marketing strategy ready? Because this year the Big Dance is a bigger opportunity than ever. Last year, 30% of people in the U.S., an estimated 90M, filled out a bracket for the NCAA Tournament. The best-rated game of 2014 reached 4.7M people. March Madness interest level is absolutely massive, with more fans than ever before following along. Focus on second screens. During March and April 2014, 40% of searches related to brackets were on mobile. As mobile searches continue to rise, marketers should increase their focus on second-screen habits, optimizing campaigns for smartphones. , 84% of smartphone and tablet owners are watching TV with a second screen in hand. For marketers, this presents an incredible opportunity to reach consumers in real-time. During the Oscars, Google Play used hyper-relevant marketing to connect with movie fans in real-time. Just before the award for Best Picture winner was announced, there were eight separate, film-specific ads ready to go live. The moment that Birdman won, ads congratulating the film were pushed to second-screen devices. What used to take hours to scale took mere seconds, and viewers could go directly to the Google Play Store to buy or rent the winning film. This real-time strategy brought huge rewards. There was a 59% lift in searches for Google Play movies among those who saw the ads, according to Google’s Brand Lift measurement tool. Start with data and insights. Data revealed that consumers watch television with a second screen in hand, and that searches for award-winning films spike immediately after the award is announced. Build creative with flexibility in mind. Make sure you can update and adapt your creative in real-time to be as relevant and timely as possible. Make real-time purposeful and additive. It’s important that your brand is adding to the user’s experience, not just interrupting the moment. Measure the impact of real-time efforts. Real-time marketing requires significant advance planning. Was it worth it? Google Play ran a test and control experiment to find out. The test versions were the real-time ads that congratulated the winners as they were announced. The controls were a group of generic ads that featured all Oscars movies on Google Play. Our test proved successful: Click-through rates of the test/real-time ads were 19% higher than the control ads. Learn more about this real-time marketing play at Think with Google. Huge cultural events such as the Oscars are too big for just one screen. According to Nielsen research, 84% of smartphone and tablet owners are watching TV with a second screen in hand. For marketers, this presents an incredible opportunity to reach consumers in real-time.